Helen Allingham (1848-1926), A Cottage With Sunflowers, Peaslake (date not known), watercolour, further details not known. Wikimedia Commons. Europe and America had some pioneering women artists during the nineteenth century, many of whom I have now covered in this series. 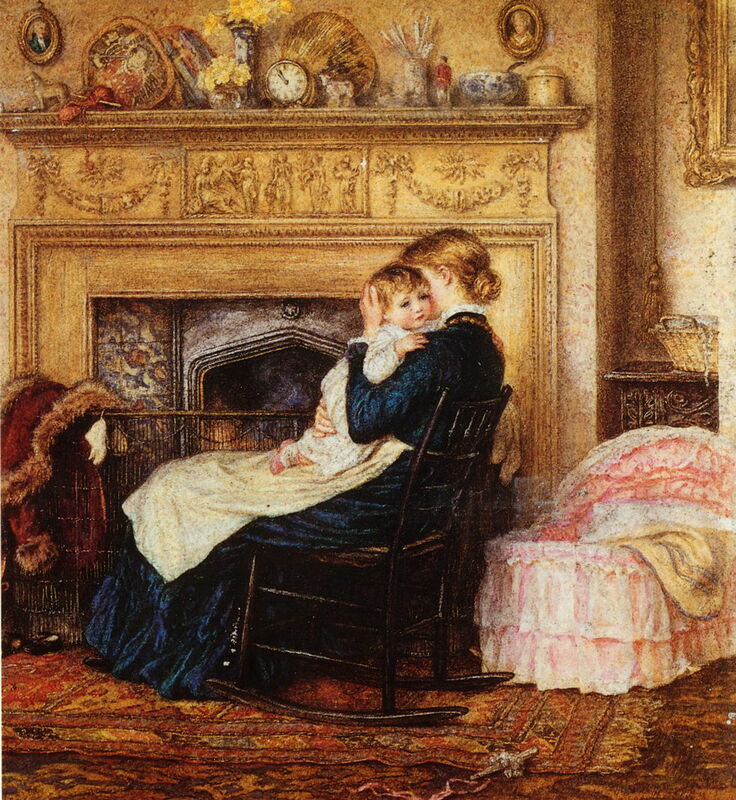 One I have not yet mentioned is Helen Allingham (1848-1926), who with her friend Kate Greenaway is often considered (or dismissed, maybe?) as an illustrator rather than an artist. In fact, Allingham spent most of her career painting watercolours which were not associated with any text. Born Helen Mary Elizabeth Paterson in Derbyshire, England, she was brought up in Cheshire, then Birmingham. Her mother’s relatives were artistic, and Helen soon showed talent for drawing. She started her training at the Birmingham School of Design, then in 1867 moved to London to study at the National Art Training School, which is now the Royal College of Art. While still studying there, she struck success as an illustrator, and was soon painting illustrations for The Graphic newspaper, magazines, and books. She abandoned her art studies to pursue illustration as a career, and in 1874 provided the illustrations for a serialised version of Thomas Hardy’s Far From the Madding Crowd for Cornhill Magazine, one of the leading periodicals of the day in Britain. She developed her painting skills in evening classes at the Slade School of Fine Art in London, where she met Kate Greenaway. She married William Allingham in 1874. He was an Irish poet, and she was able to stop her work as an illustrator, and devote more time to painting. When the couple moved out of London to Witley in rural Surrey, in 1881, she started to paint the cottages and villages through the country to the south of London, across Surrey and Sussex in particular. In time she extended her coverage to include much of southern England, and as far afield as Ireland, and even Venice, although her watercolours of Venice are less successful. Helen Allingham (1848-1926), The Last House in Lynmouth (1874), watercolor, gouache and gum arabic on wove paper mounted on cardboard, 19.1 × 26.4 cm, Yale Center for British Art, New Haven, CT. Wikimedia Commons. 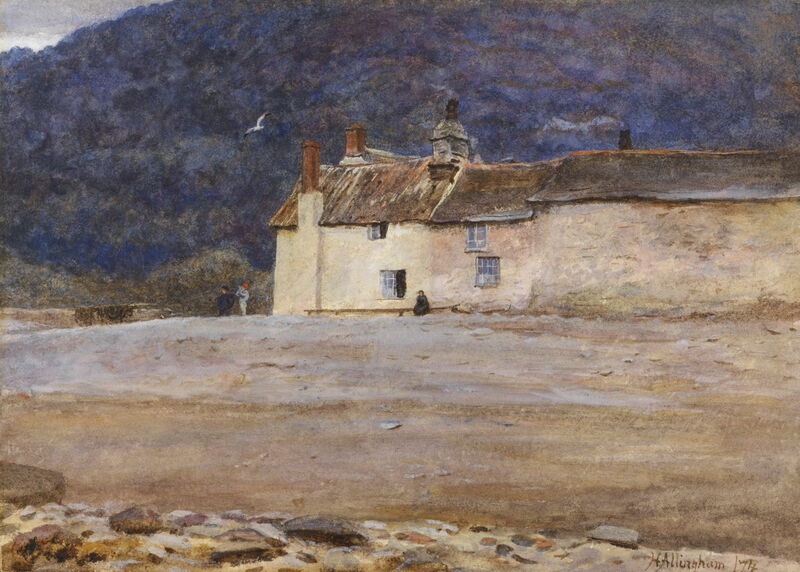 The Last House in Lynmouth (1874) was painted shortly after her marriage, perhaps when on honeymoon in the west of England. It shows the seafront fishermans’ cottages of the village of Lynmouth in Devon, on the north coast of Exmoor. Lynmouth is on the waterfront at the foot of a gorge which descends from the larger town of Lynton, over 200 metres above Lynmouth. Gainsborough had honeymooned there, and it had become quite a popular resort during the nineteenth century. In 1952, following torrential rain over Exmoor, Lynmouth was largely washed away by a flood, which killed 34 of its residents. 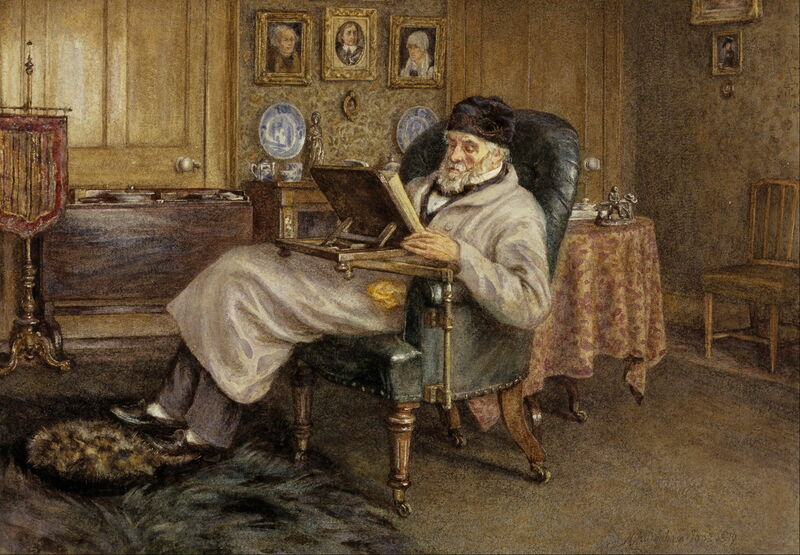 Helen Allingham (1848-1926), Thomas Carlyle, 1795-1881 (1879), watercolour on paper, 19.4 x 28 cm, National Gallery of Scotland, Edinburgh, Scotland. Wikimedia Commons. Allingham did not paint many portraits, but this of Thomas Carlyle, 1795-1881, the major Scottish philosopher, historian, and essayist, was completed just two years before his death, and remains an important work. 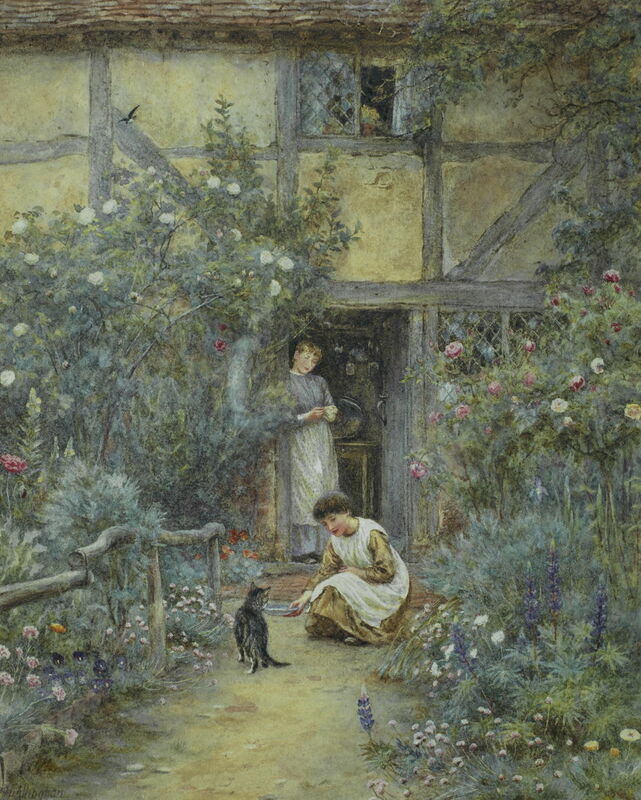 Helen Allingham (1848-1926), The Lady of the Manor (1880), watercolor and gouache, 36 × 48 cm, Private collection. Wikimedia Commons. 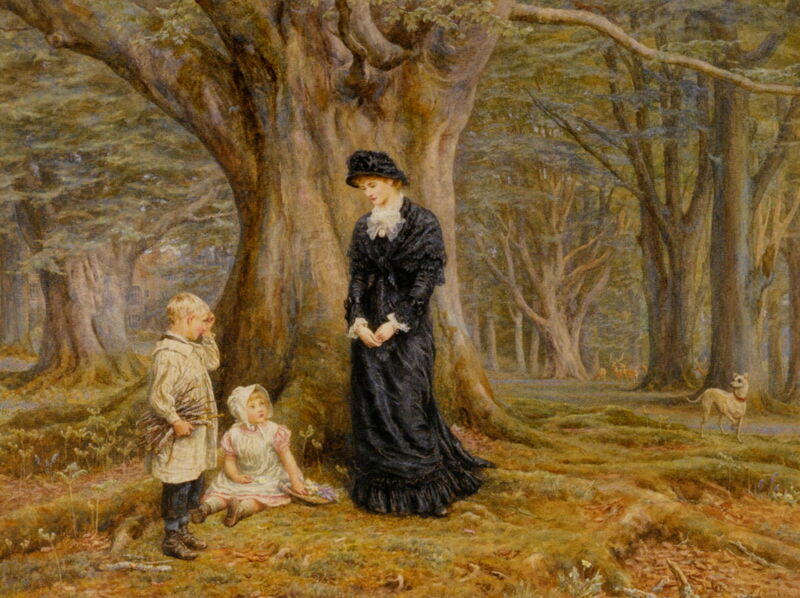 More typical of her mature work is this depiction of ancient woodland and The Lady of the Manor (1880). The manor house is just visible in the distance, behind the small boy’s head. Seen in a small clearing in the mid-right of the painting are deer, implying that this was a deer park; even then, there were few deer park remaining in the south of England. 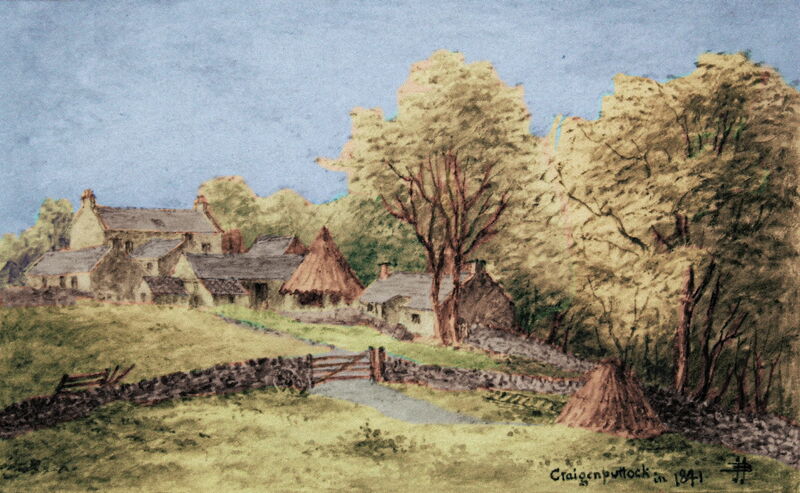 Helen Allingham (1848-1926), Rear View of Craigenputtock (1891), watercolour, dimensions not known, location not known. Wikimedia Commons. Rear view of Craigenputtock (1891) shows Thomas Carlyle’s wife’s farming estate in Dumfrieshire, Scotland, which became his spiritual home even though he lived there for only limited periods. Unlike the rest of her works shown here, this appears to have been painted (or at least started) in front of the motif, and may well have been signed there too. 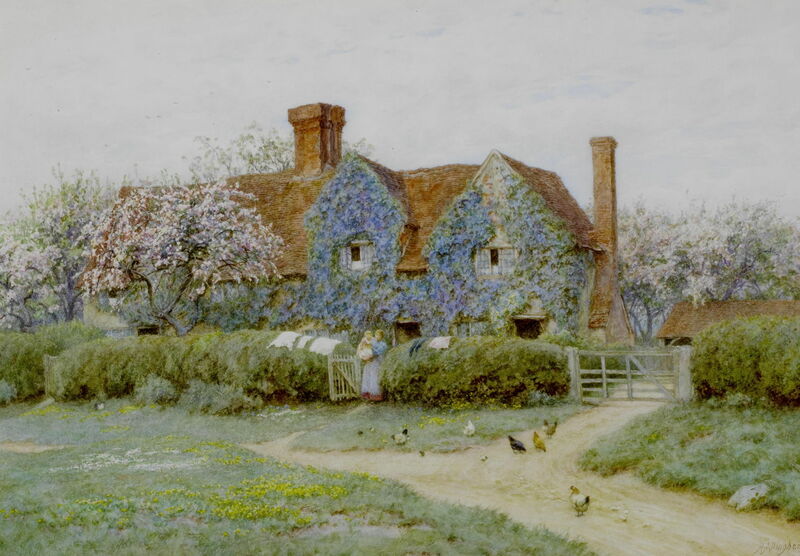 Helen Allingham (1848-1926), A Buckinghamshire house at Penstreet (c 1900), watercolour, 36 x 50.5 cm, Private collection. Wikimedia Commons. A Buckinghamshire house at Penstreet (c 1900) shows a house in the hamlet of Penn Street, which together with Knotty Green and Forty Green surround the village of Penn, near Amersham, Buckinghamshire, England. This remains a relatively unspoilt part of the Chilterns, to the north-west of London. 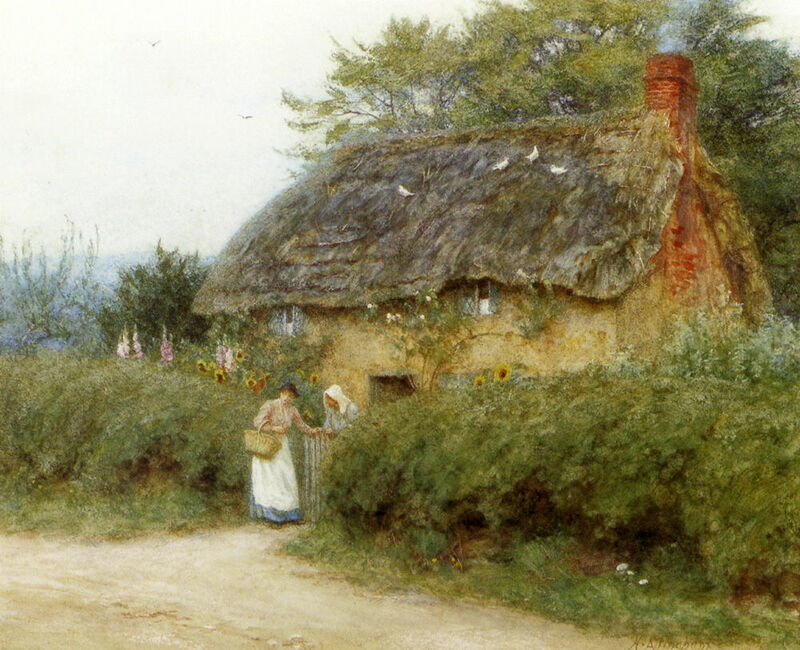 Helen Allingham (1848-1926), A Cottage Near Crocken Hill (before 1905), watercolour, size and location not known. Wikimedia Commons. A Cottage Near Crocken Hill (before 1905) shows what used to be a small village not far from Sevenoaks in Kent, England. Although the cottage may still stand, this area has been swallowed up into the sprawling south-eastern suburbs of London, and is now only just outside the Greater London border, and heavily populated if still quite leafy. The remaining paintings that I have located by Helen Allingham are all undated, but most appear to be from the period 1874-1914. 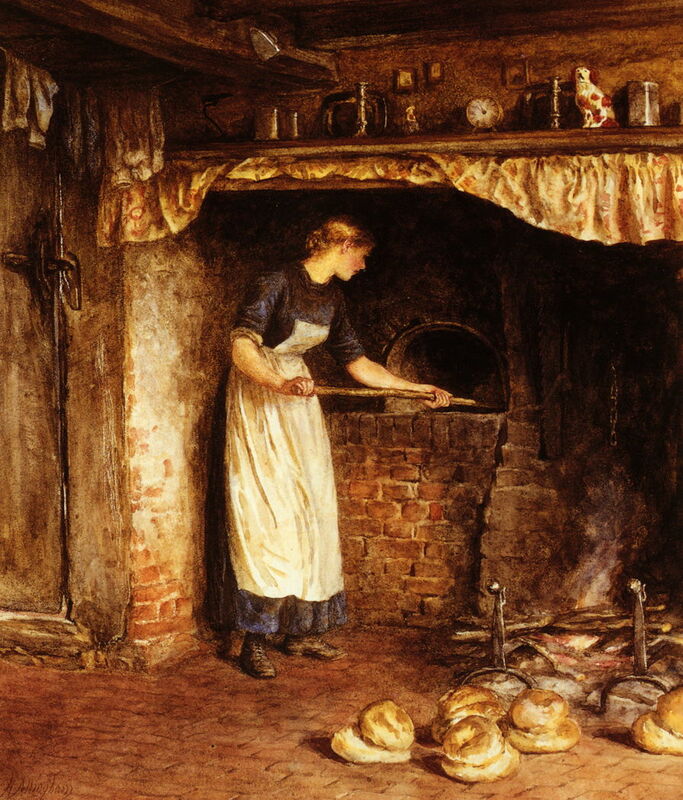 Helen Allingham (1848-1926), Baking Bread (date not known), watercolour, further details not known. The Athenaeum. Baking Bread shows a traditional farmhouse baking oven being used to bake the bread for an extended family, or possibly a small village shop. These ovens can still be found in many remaining period dwellings, but are very seldom in use now. Note the very high mantelpiece above. Helen Allingham (1848-1926), In the Nursery (date not known), watercolour, further details not known. The Athenaeum. In the Nursery shows a young woman employed as a nurse to a middle-class family, in the dedicated nursery. The fire has a guard, which would have been unusual in rooms used by adults. On the mantelpiece are what appear to be fans, probably part of the Japonisme which swept Europe and America during the late nineteenth century. Helen Allingham (1848-1926), Drying Clothes (date not known), watercolour, further details not known. Wikimedia Commons. 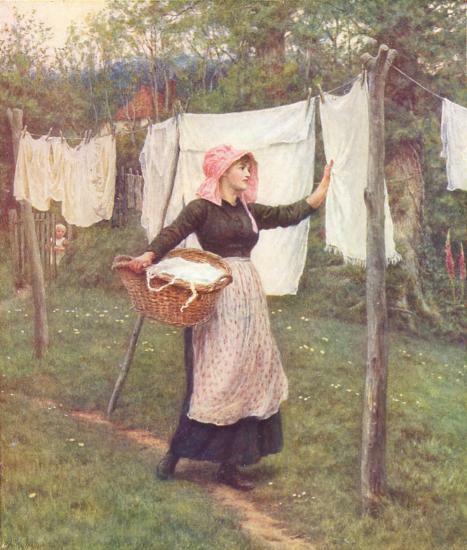 Drying Clothes is one of several watercolours which Allingham painted of this everyday domestic activity, invariably undertaken by one of the servants. I find it curious that, when male Impressionists painted women washing clothes or hanging them out to dry, we feel it necessary to provide an elaborate interpretation in terms of gender roles and sexuality; it was and remains a common motif for painters of all genders. Helen Allingham (1848-1926), The Saucer of Milk (date not known), watercolour, 26 x 21 cm, Private collection. Wikimedia Commons. The Saucer of Milk shows another popular domestic scene: attending to household pets. Cats were not just kept as pets, though. In country cottages, they had an important job of keeping the population of mice under control, so pampering them was not just an innocent pastime. Allingham’s paintings are also valuable in documenting traditional cottage gardens, which virtually died out after the First World War. Helen Allingham (1848-1926), Children On A Path Outside A Thatched Cottage, West Horsley, Surrey (date not known), watercolour and pencil, 22.8 × 30.9 cm, Private collection. Wikimedia Commons. Children On A Path Outside A Thatched Cottage, West Horsley, Surrey shows another small village which has changed dramatically since. Not far from the Allingham home in Surrey, West Horsley is between Guildford and Leatherhead, an area which has been heavily developed through the twentieth century. It is now described as ‘semi-rural’. A Cottage With Sunflowers, Peaslake is not far away, about five miles to the east of Guildford. Although much of this area has been preserved, its roads are extensive and very busy, particularly in the summer. It is not far from the location used by John Brett for his masterpiece The Stonebreaker (1857-58). 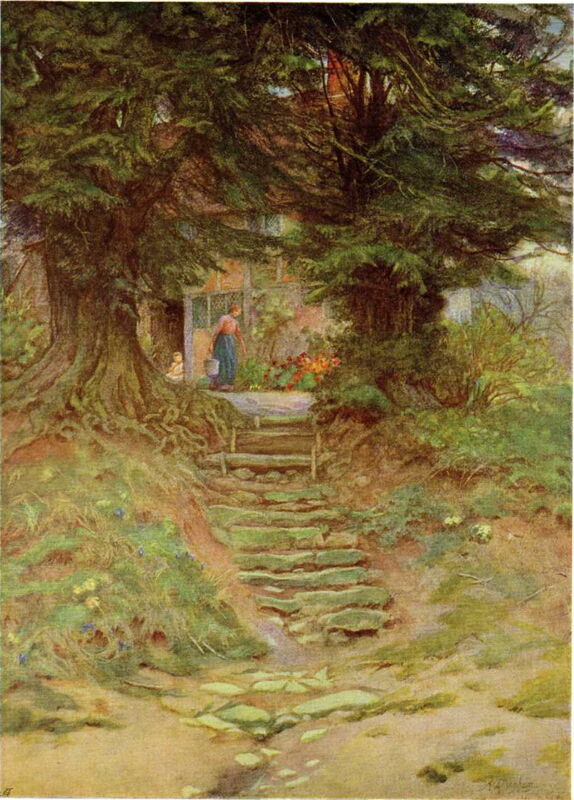 Helen Allingham (1848-1926), A Mother And Child Entering A Cottage (date not known), watercolour, further details not known. Wikimedia Commons. 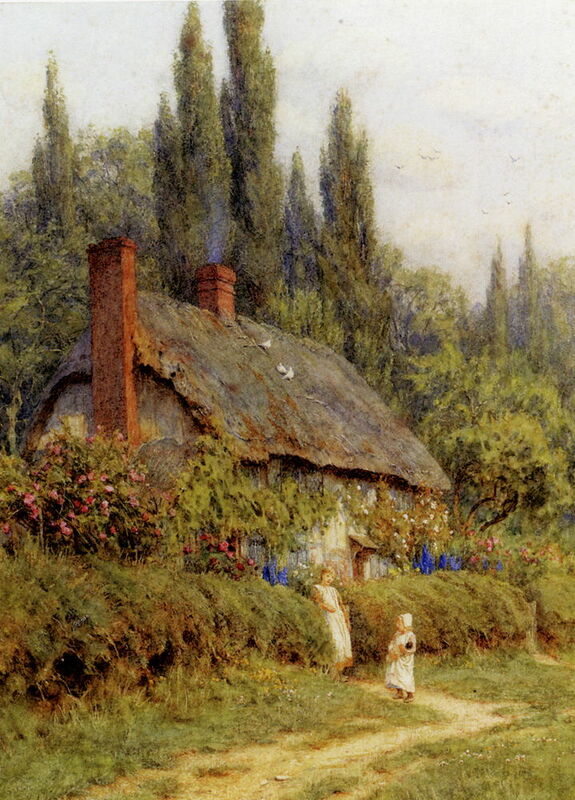 A Mother And Child Entering A Cottage is another view of a cottage somewhere in the south of England. 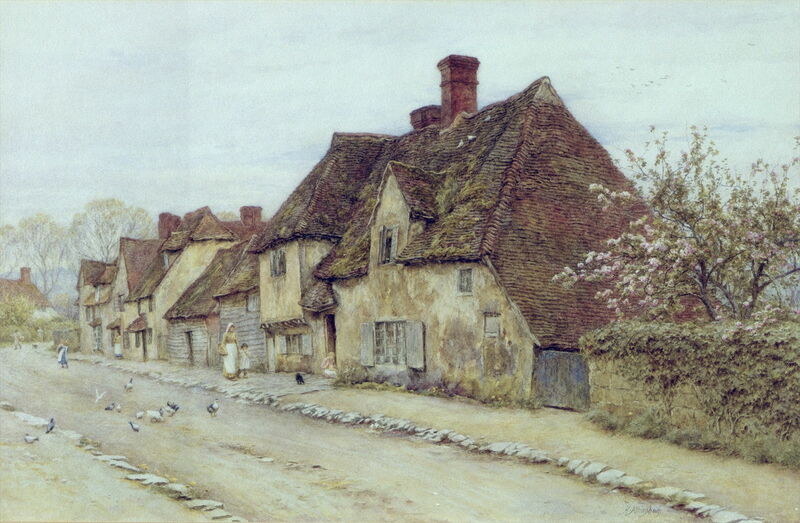 Helen Allingham (1848-1926), A Village Street (date not known), watercolour on paper, 34.4 × 53.5 cm, Private collection. Wikimedia Commons. A Village Street is a view which was quickly lost as motor vehicles took to the roads in the twentieth century. As usual, Allingham is honest in her depiction of the gently neglected state of most rural buildings, but this view does not show the drainage ditch (open sewer) which still ran through the centre of most villages, nor the mud and excrement which covered the roads and pavements for much of the year. 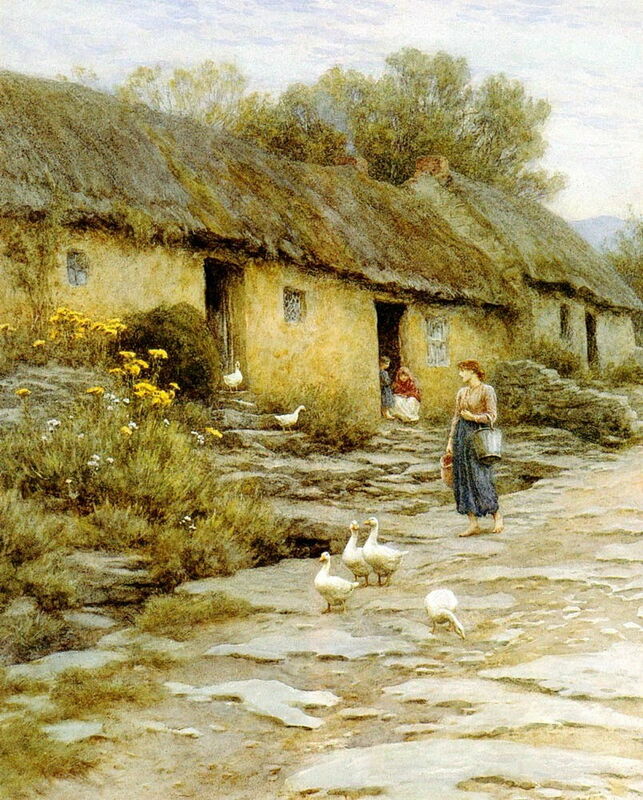 Helen Allingham (1848-1926), Irish Cottage (date not known), watercolour, further details not known. Wikimedia Commons. Irish Cottage is again a faithful representation of the motif, but tells nothing of the squalor in which most occupants of these cottages had to endure. 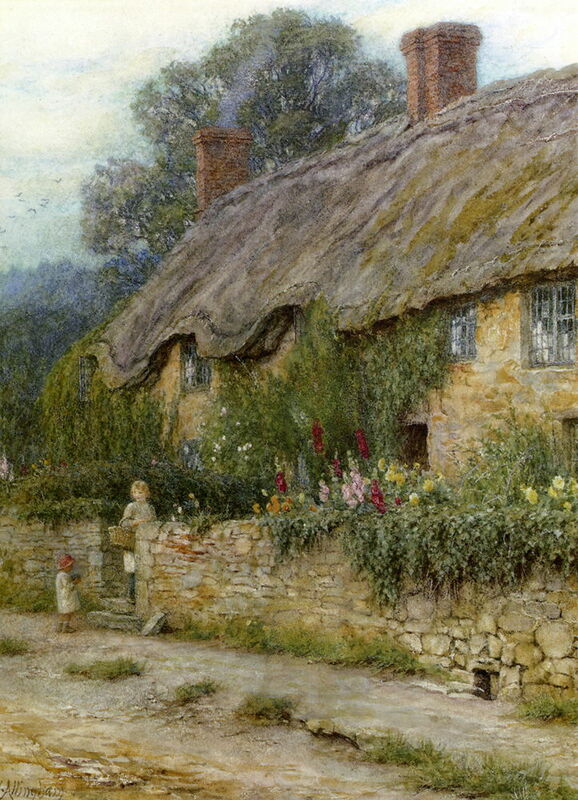 Helen Allingham’s countryside is idyllic, it is forever summer, with the banks of flowers in perpetual bloom, and the occupants clean, healthy, and happy. It is a world long lost – indeed, it may never really have existed except in her imagination. The harsh reality was that even affluent middle-class families such as her own (her father was a medical practitioner) commonly faced tragedy: her father and three year-old sister died in 1862 during an epidemic of diphtheria. You couldn’t imagine something like that happening in her eternal countryside. Posted in General, Painting and tagged Allingham, Brett, Greenaway, landscape, painting, women in art. Bookmark the permalink.